Checks are to be made on the track foundations of the long-delayed guided Cambridge to St Ives busway. 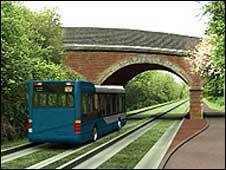 The builder of the £116m busway, BAM Nuttall, is to carry out bore hole testing to check soil conditions. Cambridgeshire County Council said BAM Nuttall expects to finish the work by its self-imposed deadline of mid-June. The foundations are one of six issues holding back the completion of the £116m guided busway, which began in 2007 with a spring 2009 opening date. Bob Menzies, the council's head of busway delivery, said: "We need to be sure that when the busway is handed over to the council it is an asset that will benefit residents for many years with minimal maintenance. "It is good news that the contractors have confirmed their plans to carry out the necessary testing as we need them to show the foundations are robust and the track will continue to give a smooth ride for passengers over time." He added that BAM Nuttall only needs to check a short section of the track foundations as the vast majority has already been "signed off". Among other concerns are widespread flooding along the busway track and expansion joints of the River Great Ouse viaduct. Investigations of these issues and remedies will be agreed over the next few months.